By Natalie Dolce (Event Coverage – SAN FRANCISCO) Developing a mixed-use property makes difficult sites feasible from a financial perspective. It makes it more attractive. That is according to David Pierce, SVP of development at Inland American, during a mixed-use panel at PCBC. He pointed out that retail, even if a minor component at the property can bring 30% of the income on the site making it worthwhile for a higher land cost. 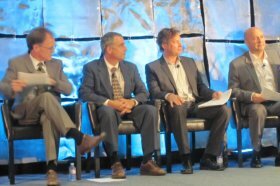 The panel, titled Mixed-Use Means More Money, was moderated by Mike Kennedy, an SVP at Avison Young. When he asked panelists another benefit to having mixed uses at multifamily properties, Hal Fairbanks, VP of acquisition at HRI Properties, said that having a mix of uses can also help in community support for the project to actually get done. There are a lot of market intangibles, he said. (c) Copyright 2014 GlobeSt.com. All rights Reserved.